Akaganetoyo Falls (あかがねとよ) is a waterfalls located in Osaka, Gifu. It is 14m high. Akaganetoyo literary means a red rain gutter. This waterfalls is made from the lava of Mt. Ontake. This waterfalls get dry easily, but because water also goes underground, the basin of a waterfall never dry out. 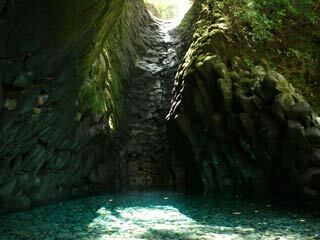 It is located Mitsutaki Course of the hiking and sightseeing courses of Osaka Waterfalls.